Hey Beauties! Anyone who knows me well will know I'm a bit of a 'Bath Queen' When it comes to bathing I go all out and pamper myself from head to toe. From flowers to crystals I do it all and find the whole process so relaxing and indulgent, which is often just what I need after a long week at work. I hope you enjoy this post, but if you're more of a shower person don't worry! I will be sharing my luxe shower routine soon. Purchasing a Bath Rack took my 'Pamper Routine' to a whole new level, as it meant I didn't have to lean across to my bath table all the time to pick up my goodies. Dunelm have a lovely range of Bath Racks from only £10. Plus, they're super instagramable! Nothing sets the scene for pamper time like a gorgeous candle flickering away gently. My absolute favourite are the opulent Neom Intensive Skin Treatment Candles (£36). After 30 minutes of burning, they are ready to slather over your body as a highly moisturising treatment... pure bliss! However, you don't have to spend the world on a luxury candle as Homesense UK have some amazing candles for a fraction of the price. Another beautiful way to relax is with a Himalayan Tea Light Holder (£6), which will have you saying goodbye to those negative vibes in no time! If you're like me Bubble Bath is essential when it comes to my pamper routine. A few bubbles make the bath more comforting and the gentle popping of the bubbles is really relaxing too. My favourite bubble bath is the Neom Perfect Night Sleep Bath Foam (£22) I also love LUSH Bubble Bars, which can be used several times and are a lot more cost effective. I'm currently using the LUSH Purple Drain Bubbleroon (£4.75) which is gorgeous and gives the bath a relaxing purple hue. If you're looking to try something new, The Miss Patisserie Bath Slabs (£5) are a great way to have some fizzing foaming fun. When it comes to bath bombs I feel like LUSH lead the game in terms of choice, effectiveness and the quality of their ingredients. My favourite is their Intergalactic Bath Bomb (£4.50) which is so uplifting and make's the bath look like the Caribbean, a girl can wish right?! They have so much choice though and there really is something for everyone. I also really like Bomb Cosmetic Bath Bombs, which are cheaper at around (£2.99) and their selection is so pretty. Why not treat yourself to some Bathing Flowers (£8) to create your very own picture of zen. You can also create your own Chakra Bath for the ultimate detoxifying experience. 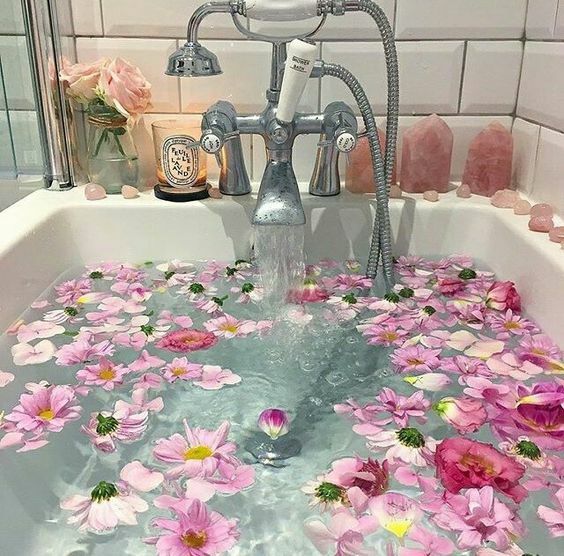 That bath looks SO dreamy!! Is it sad that I want to make one just like it for an Instagram pic haha? You've mentioned so many products that I'm really eager to try, thanks India!